LONDON -- Stephen Hawking is a scientific superstar. Now he's going to mix with rock stars, taking the stage at the UK's Glastonbury Festival. 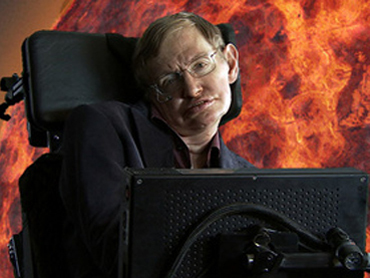 Hawking, who is almost completely paralyzed from motor neuron disease, is one of the world's best-known cosmologists. His book "A Brief History of Time" has sold in the millions. He has previously voiced his own character on "The Simpsons," appeared alongside comedy troupe Monty Python and featured on a track by Pink Floyd. And recently he weighed in on an unlikely pop culture topic: Zayn Malik leaving the group One Direction. During a remote Q&A in Sydney, Australia, Hawking told fans, "My advice to any heartbroken young girl is to pay close attention to the study of theoretical physics. Because one day there may well be proof of multiple universes. It would not be beyond the realms of possibility that somewhere outside of our own universe lies another different universe. And in that universe, Zayn is still in One Direction." This year's Glastonbury lineup also includes Pharrell Williams, Florence And The Machine and The Who. One Direction is not on the lineup - at least not in this universe.